Since not all my posts will contain a feature image I had to find a work around that would allow the text content to show properly in the slider. In order to do this I added a very tiny white square as my featured image. When it first displayed the caption for the post was at the bottom and ran out of the visual area (couldn’t even see ‘Read More’ button). In order to accommodate this I modified the CSS for the slider so that the caption starts at 20% from the top instead of its default of 40%; in hopes this will also work for future blog posts without a featured image. It is worth noting that a caveat I have discovered is that this is insufficient for smaller screen sizes so I may have to become more ‘clever’ in my featured images; like I did for this post, when I can. Ever since I decided to start up my own website (again) with the intent of having it for a long time I knew there were two key things I needed to do, besides the content itself. The first was to come up with my domain name and the second was to find a WordPress theme that I liked. I wanted the theme to contain some key features I was looking for as well to have a style that I liked. I spent time over the past month or so looking at themes and testing some I thought I might like before finally settling on Revera as a solid start to what I was looking for. 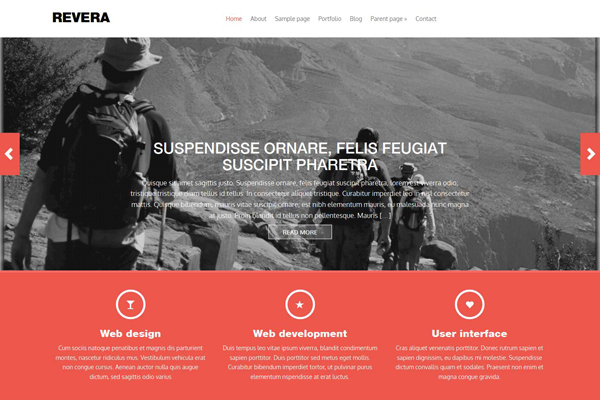 Revera is a free premium WordPress theme that contains many features that I was looking for. This includes being a responsive WordPress theme utilizing the Bootstrap 3 framework, custom menu, portfolio page template, and blog (which might not be so much a feature as ‘just is’). One feature it has that I am still uncertain as to how much I am going to like is featured images for your posts. I do like how they display prominently on the homepage to advertise new blog posts and display for portfolio elements; however, since I am not using it for photography there may be cases when an image in my post does not make sense, or that it should not be featured. I intend to utilize the portfolio section to showcase applications once a stable release is completed. Since I discovered a theme that had a solid foundation for me to build off I progressed into performing some customizations to brand the theme for me and gain some additional functionality. The first customization I performed was to ‘mini-brand’ my site by changing the colors to what I wanted, which was a darker shade of green as it is my favorite color. In order to do this I modified theme.css by changing the appropriate hex codes to the appropriate hex code for the shade of green I required. Below the left hand side represents the hex code for the default color and the right hand side represents my color choice. I also modified the color for the arrows on the homepage to match by modifying bg_direction_nav.png using MS Paint. I am not sure if I am going to stick with the red link color or not as I plan to get some opinions on the look of red on green. I at least have the CSS styles in place for if I want to change that color or have a different color for visited links. * The template used for displaying page content in page.php with no title. That’s it! Besides some basic text changes for various displays (i.e. blog section) that is all the code modifications and additions I made, to date, in order to get the theme to what I have envisioned for my virtual home.